I was pleasantly surprised by this recipe. Shocked, even. You see, I dislike your typical white bread knots. The fancy shape is usually there to cover up lackluster taste, to make you overlook subpar texture with the novelty of a roll tied into a knot. Well, ok, not exactly. The knots aren’t really there to mask texture, the poor texture is caused by the knots. See, the more you work a dough, the more the gluten is developed. Overdeveloped gluten affects bread two ways: one, by making the bread tough and overly chewy; and two, by failing to trap the gas given off by the yeast, which makes the bread flat and dense. Letting dough fully rise, rolling it into ropes, and tying those into knots, all help to develop gluten. In most cases, this results in poorer-quality bread. This recipe is a bit unusual in that you don’t really need to let the dough have an initial rise. Also, it’s made with a large percentage of yeast, as well as the use of cool liquid rather than the usual warm liquid. Why? Well, it’s all about the gluten. Basically, we’re making a yeast time bomb here. When the yeast start producing gases, it stretches the gluten. You don’t want that sort of uncontrolled gluten activity until the rolls are formed into knots, so we keep everything cold to keep the yeast under wraps until we’re ready for it. The large amount of yeast means we get the most air produced in the bread in the least amount of time. Don’t worry, it won’t taste yeasty. You do knead the dough a fair amount in the initial mixing step, so much that it would be too much kneading in many other bread recipes. But since you don’t get the help of the yeast to develop the gluten, you’ll need that structure. I know many of these steps seem counter-intuitive, but you’ll just have to trust me on this one. It all works out in the end. Incidentally, this recipe directs you to use a stand mixer. Making this one by hand is difficult, since your hands will warm the dough too much. It’s also hard to properly develop the gluten structure needed by hand, especially without adding too much flour. So don’t let me stop you from trying by hand, but you will achieve the best result with a stand mixer. The instructions here make a simple single knot, but if you know how to tie more elaborate knots, have at it! If you like, this dough can also certainly be used to make a braided loaf instead of rolls. The bread you end up with, however you tie it, is soft, but not aenemic, mild-flavored, but not insipid. 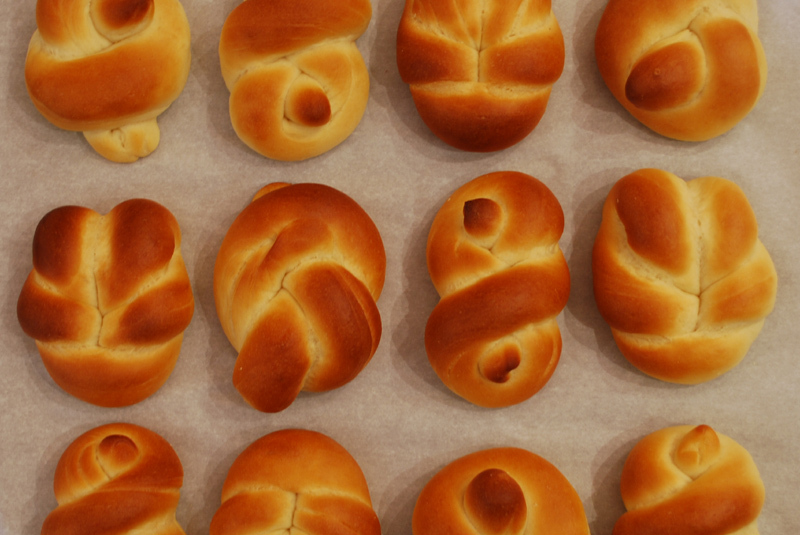 It bakes into cheerful little rolls that are almost a joy to pull apart, and would be a perfect addition to any special bread basket. Even I would go back for seconds! 1. If using active-dry yeast, dissolve the yeast in the milk in the bowl of a stand mixer. Add the flour, sugar, and salt. If using instant yeast, mix the yeast in with the flour, then add the sugar and salt, then add to the milk. Mix, using the dough hook, until the dough forms a ball. Incorporate the butter. 2. Knead at medium speed until a fine gluten structure develops, 8 to 10 minutes, scraping down the bowl or dough hook as necessary. Test the gluten by pulling off a small piece of dough and stretching it lightly; if it forms an almost translucent membrane, the dough has been kneaded enough. Do not overknead. If the dough is overkneaded, the gluten structure will be permanently damaged, resulting in loose and hard-to-work dough that will not rise properly, if at all, because the damaged gluten cannot trap enough air. 3. Place the dough in an oiled bowl, turn to coat all sides, cover with plastic wrap and let rise until doubled in volume, about 1 hour. However, if your kitchen is unusually warm, or if you are inexperienced in forming knots, skip this step. 4. Punch the dough down. Place it on a sheet pan lined with parchment paper and flatten it. Cover and chill for 30 minutes to 1 hour. If you will not be making the rolls until the following day, you can freeze the dough at this point. Let thaw before continuing. 5. Remove the dough from the refrigerator and punch down. Divide it into four sections, and each fourth into five pieces (about 2 ounces each, you should have twenty pieces total). Keep the pieces you are not using covered to prevent a skin from forming. 6. Roll one piece at a time into a 9-inch rope and tie it into a loose granny knot so that the ends protrude just slightly beyond the body of the roll. Place each formed knot on a sheet pan lined with parchment paper, and cover loosely. Let the knots rise until slightly less than doubled in volume, about 45 minutes to 1 hour. Preheat the oven to 400 degrees F.
7. Brush with egg wash and bake for 15 minutes, or until properly browned. Remove to a rack and let cool to room temperature. 1. Do not use the milk cold directly from the refrigerator. It will kill your yeast. The milk should be slightly cool to the touch, and not warm. 2. Feel free to add herbs as you like to this dough. I’m not sure why, but knotted rolls like this are often herbed. Dill and parmesan are classic and lovely, and chive with garlic powder would be great.